Interpretations of the Third Pinnacle of Life (Numerology Lesson 21) | Law of Attraction Plus: The Secret revealed! You will find here the interpretations for your Third Pinnacle number. Once again to calculate your Third Pinnacle number, which describes your developing years (from the late thirties to the early forties depending on your Life Path number) you must add the year of birth plus the day of birth and reduce it to a single digit. Don't reduce this down to a master number if the result is a master number 11 or 22. Below is your reference for finding out when the Second Pinnacle Period will occur in your case. 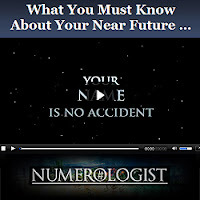 Note that to find the timing you also need to calculate your Life Path number. Notice too that this period is shorter for some numbers and longer for others. If you have not been able to realize any of your dreams by now you will probably act like a bull in a china shop, taking out your frustration on all that dare bring up how little you have achieved. However if previous periods favored your independence and opportunities for leadership you will likely see yourself promoted to where you want to be during this phase. If you have let disputes or family problems go unattended for some years then you are likely to face them as full-blown crises at this time. It is also likely that you may have lost control of your career and by necessity have to work for someone else or are making a lower income than you expected. If you have always wanted a career in show biz or the arts, you might be given a chance for fame later in life during these years. This is definitely an inspirational time that will also serve to expand your social circle. You might also find yourself becoming an influential voice in your community. Falling in love is also possible. This phase will have you reaping what you have sown so far in life. If your previous Pinnacle numbers were supportive to career and money then you will likely see a big pay off from those efforts. If you have worked long and hard to earn somebody's heart than you will likely fall in love. If you have not put much effort into anything then this could be a difficult, lonely and even poverty-stricken time. This influence may have you face a sudden change of some kind that necessitates the need for you to be very adaptable or flexible. You could face a lay off or get a job in a foreign country. You might also have to adjust emotionally after a divorce or a death. Still this influence indicates a second chance for a success and a brand new start in life. During these years finances and career will be of less concern and your focus will turn to enjoying the company of family and friends. Sometimes this influence brings an older relative to live with you or brings new additions to the family (especially grandchildren.) Peace, abundance and family happiness usually dominate these years. This period may bring with it an upsetting incident that throws you for a loop emotionally or puts you in a negative state. Your overall inclination will be to avoid other people and escape into fantasy or addiction. This also might indicate a period of being a workaholic, where nothing else matters but money or fame. Many people seek therapy for a mid life crisis during this kind of phase. These years could bring you a period of unexpected prosperity. You may finally acquire all of the material things you need or acquire a property. An inheritance or lottery win is also likely at this time. A second career or home business started under this influence is also likely to return a generous income. This influence may bring you a spiritual awakening of sorts that makes you want to do more for others than you do for yourself. World events and problems may concern you more than usual and you may be more inclined to live by your convictions. Often during this phase individuals get rid of people or jobs in their life that don't agree with their ethics. At this point you are likely to suffer some sort of mid life crisis that makes you search for the deeper meaning of life. This influence usually brings some sort of shattering of illusions and the need to make careful plans about how one can realize the goals of their higher self in the future. You may also be very interested in spirituality or the occult during this phase and less interested in money or your social life. Usually this influence at this time brings some kind of award or great achievement, especially if your other Pinnacle numbers have supported your aims in the past. If not you will still be given the opportunity to show that side of you that "dares to be grand" whether it be in the spiritual, business or relationship areas of your life. The overall theme of this influence is very calm, upbeat and positive. Next lesson we will be looking at all of the interpretations for Fourth Pinnacle Period Number.